Cllr Tina Harris, Chairperson of Halewood Town Council and Mayor of Halewood accompanied by her consort, Cllr Edna Finneran. 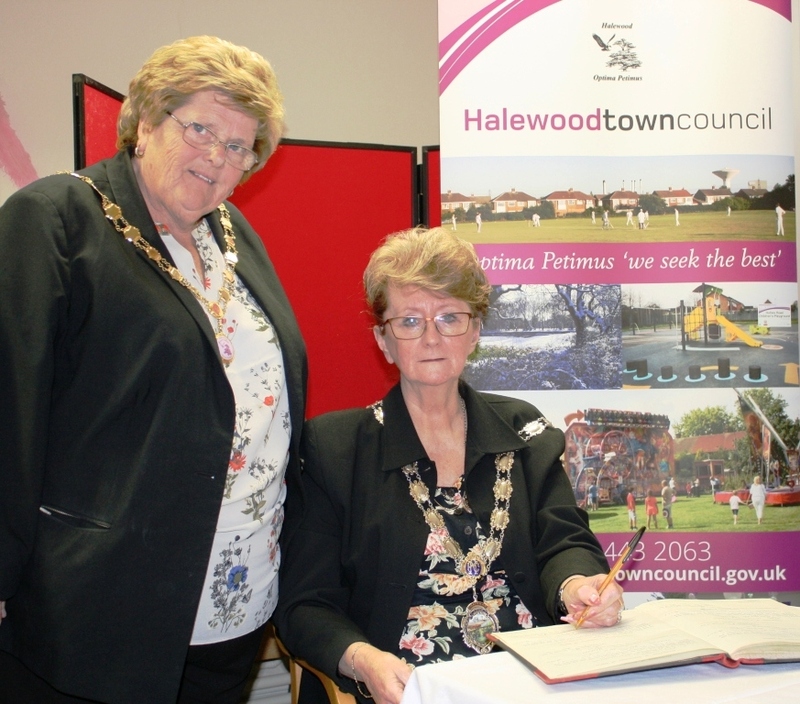 Summarising her year of office, Cllr Tina Harris writes…. It has been an honour and privilege to be Chairperson of your Town Council during 2017/18 and Mayor of Halewood. The year has been one of many ‘highs’….starting off with a delightful morning spent in the company of children from Halewood C of E Primary School, proud winners of our design competition in Elwyn Gardens. Our ongoing partnership with First Ark again paid dividends when Halewood Indoor Bowls League secured funding for new bowls mats and we are grateful for the additionality which First Ark Group brings to the Town Council. This years Culturefest cricket match was blessed with slightly better weather than in 2017 and I was delighted that ‘my team’ won the Patron’s Pot which is proudly displayed in the Town Council offices. Once again the RLPO concert was a great start to Christmas in Halewood and at Hollies Hall and the Arncliffe Centre we again hosted and offered a range of activities. Hollies Hall was of course the venue for our Pupil Recognition and Community Achievement Awards….what an inspirational evening! This year has certainly seen my representing the Town Council at many quite diverse events; tree planting in St Nicholas’ Churchyard, the opening of our new kitchen facilities at the Arncliffe Centre, an open air Fish and Chip Lunch on Church Road, and the Pride of Merseyside awards where Knowsley Dementia Care Support – Memory Lane were runners up as Community Group of the Year; all different events in their own right and equally enjoyable. The crowning glory of course was being awarded Council of the Year for 2017 by the National Association of Local Councils…..receiving the award was a proud moment for me and for the whole Halewood community. My personal thanks to the Members and staff of the Town Council for your support during the year but most of all, thank you to each and every group and resident who do so much to support our community.